Norma Jeane II, 3D printed sculpture will be up for acution during 3rd Auction, Friday Oct. 27 8pm. Lot #171 starting bid $800. Click here to view Norma Jeane II design process. On View Mon, Tue, Wed, & Fri 1-8PM, Thu 1-8PM, Sat & Sun 1-5PM. 1st Auction: Fri., Oct. 6, 8 pm. The Auctioneer for all three auctions will be Nicholas M. Dawes. Reception on Wednesday, October 4, 6-9pm. The Salmagundi Club hosts its Annual Fall Auction as a fundraiser to benefit the SCNY, a 501(C) (3) nonprofit organization. SCNY was founded in 1871, as a center for American Art, is a tax-exempt, educational, and charitable organization. Housed in a historic building, SCNY offers programs including art classes, exhibitions, events, and lectures for members and the general public. 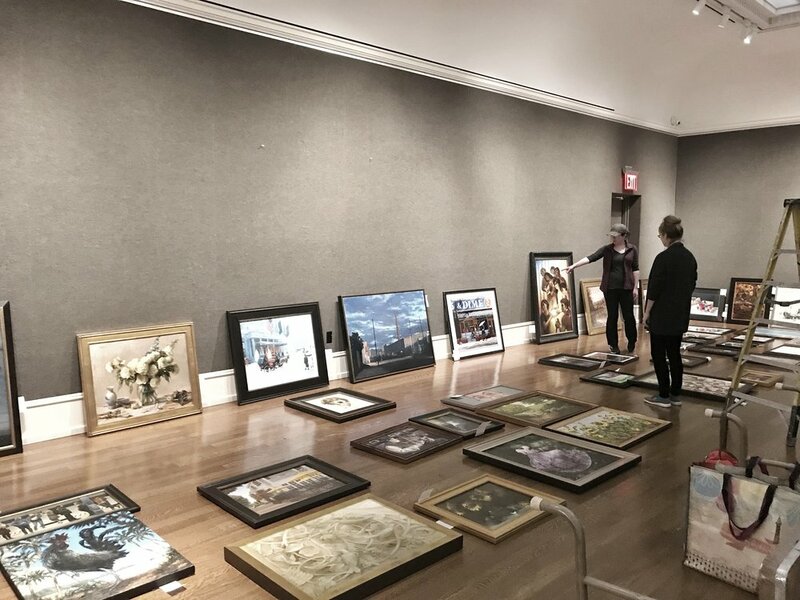 Works of art by current Salmagundi members in media including painting, graphics, sculpture, and photography will be auctioned. This is a fundraiser for the club and a large percentage of the selling price is considered as an artist donation to the SCNY. Art Collectors since the early 1900’s have attended SCNY Auctions for the opportunity to purchase quality art work by living artists. 2) By Absentee Bid. Click here for the form. Fax to (646) 349-2275. 3) Live online bidding will be accepted during the auction events at LiveAuctioneers.com. Images available Thursday, September 28. 4) By phone. Call 212.255.7740 in advance to register to bid from wherever you are. We will call you during the auction just prior to your lot coming to the block. A 10 percent buyer's premium will be applied to all purchases. Nicholas M. Dawes has been an active Salmagundian for several years and a professional auctioneer since 1980. He is a former auctioneer for Phillips and Sotheby’s in New York, and currently is Vice President and Auctioneer for Heritage Auctions, the world’s third largest auction company. Nick has conducted charity auctions throughout his career, helping raise tens of millions of dollars for many causes. I'm honored to be selected as one out of ten finalists competing for Dacia Gallery Spiritus Lumine. My artwork Norma Jeane II will be exhibited in Dacia Gallery from June 14 - July 6, 2017. If you have yet to make plans for Thursday, June 15, come join me at the Opening Reception and let's celebrate! Norma Jeane II, Close up, 3D sculpted and printed in white vero. 5" x 7"
Norma Jeane II, Close up side view, with hand drawn black ink line spotlighted onto the vero. To read about my inspiration and process, click here. Photo-ops with my friends Calvin and lovely Samara. Norma Jeane II 5" x 7" 3d Printed in white vero. Gazing into Norma Jeane or Marilyn Monroe. Discussing my concept with Suzanne and Troy.